Address: 70 Iben Gvirol st. If you try to find a translation of the French word 'brasserie', you'll probably stumble upon a definition such as: "A restaurant serving alcoholic beverages, especially beer, as well as food, usually cheap." Well, that would be a bit deceiving, as it's definitely not cheap and they serve good wines instead of beer. The food though is a fine gourmet dining in a cosy, semi-poshy restaurant. 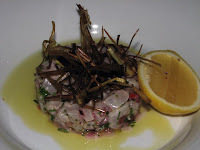 We tried the onion soup and corvina fish tartar as the starters. 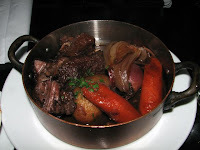 For the main dishes, we took seabass and beef bourguignon and for dessert - tarte tatin. Unfortunately, although filled with high expectations, we didn't like some of dishes we ordered. The fish wasn't special at all and it didn't justify its price (95 NIS). The tarte tatin tasted awful and after one bite we didn't want to eat anymore and gave it back. But to end it with a posiive note, the fish tartar was amazing and same with the beef (both are served on Thursday, see detail below). Except for the annoying recommendations of the waitress (see detail below), the service here is quite good. For a romantic dinner or for celebrating a special occassion, this is definitely the place to be in the center of Tel Aviv. Because of its popularity, it's recommended to make reservations beforehand. 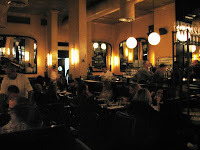 Brasserie is facing Rabin square on Iben Gvirol st.
* Detail no. 1: Beware of the recommendations of the waiters, they will keep on pushing you to order the special menu of the day (see detail below), which as expected also has special prices (they will say: "We tried this dish before our shift, it's absolutely great!"). Well, these students have to earn something, don't they? * Detail no. 2: They have a daily specialties menu which offers unique dishes.